Here’s Your Hat - What’s Your Hurry? May I Sell a Vowel Please? Last night the Republican group of 10 had their first Presidential debate. Podium order was chosen at random, and since questions directed at the entire panel were answered starting from the left end, Mitt Romney lucked out by getting that position. John McCain was in the right half and Rudy Giuliani was next to last. The event was held at the Presidential Library of Ronald Reagan, the most overrated President of the modern era. Almost everyone agrees Bush II failed to plan adequately for post-war Iraq, which is now a chaotic shambles. But Reagan is praised for supposedly ending the cold war by arms racing the Soviets into bankruptcy, without being criticized for failing to adequately plan for a post cold war Soviet Union. The Reagan policy not only financially broke the Soviet Union, but also plunged the U.S. into great debt, and left the world with huge amounts of unsecured nuclear weapons and materials in the former Soviet Union, the very materials most likely to fall into the hands of terrorists. 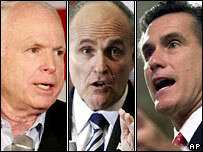 Among the front three, Romney wins the beauty contest hands down, looking successfully handsome. He also had the smoothest delivery and most appealing voice. He had prepared well for the question of the role religion plays in the decisions of a President, answering it deftly without mentioning any specifics of his Mormonism. McCain looked jerky in his mannerisms - he walks and gesticulates in an awkward manner, and at one point I think I heard him asking another candidate what the question was, as if he was not attentive or had trouble with his hearing. In response to criticism that he seems to be lacking energy on the campaign trail, last night McCain seemed as if he had downed a couple espressos. Giuliani was the most uncomfortable, since his position on social issues is quite the opposite of the other candidates and most of the republican base. His answers, though honest, seemed pained and watered down. The group of 10 recited the Republican mantra about taxes and terrorism being bad, and religious faith and family values being good. When questions got more specific, the answers got quite unresponsive and degenerated into stump speech snippets. Republicans have nothing new to offer, so the content of all the answers was boring, though Romney did actually get more specific on some tax and economic answers than the other candidates and also referred to a new possible scientific way of dealing with the stem cell research issue. One interesting question did not get the follow through it deserved; as the moderator asked the panel whether they believed in evolution, Romney started with a fairly long answer and before the next couple answers had finished, the moderator asked for a show of hands from those who did not believe in evolution and three or four hands went up to some degree. The three leaders were just supposed to avoid mistakes and they all did that, though McCain’s re-energized performance was marginal. Giuliani survived the tough social issue questions that were thrown at him. Romney, the lesser known of the three, helped his cause and was the winner in my opinion. Actually, one of the front runners was not even present, Fred Thompson, the actor and former Senator who has not announced his candidacy - yet. Republicans are fast to criticize actors who support Democrats, but also quick to embrace actor candidates like Thompson, Reagan and Arnold Schwarzenegger. Republicans need actor candidates, because actors can more effectively pretend the Republican platform is good for everyone, not just the corporate sponsors of Republicanism. The oddball in the group was the curmudgeonly libertarian Representative Ron Paul from Texas, who was the only candidate who opposed the War in Iraq from the start. Paul ridiculed the hand wringing over a nuclear device or two coming into the hands of a middle eastern state, by pointing out we survived decades during the cold war with the Soviets having tens of thousands of nuclear weapons. Sam Brownback - Give him the Mister Pious award. Jim Gilmore - Sensible sounding and in good control, but no “pop”. Mike Huckabee - Appropriately self-effacing - and unnecessary. Duncan Hunter - War monger in need of anger management. Ron Paul - Could look Denis Kucinich in the eye - in more ways than one. Tom Tancredo - Who? His position at the end of the line seemed appropriate. Tommy Thompson - Most in need of a makeover. I enjoy your summary of the major events of the campaigns of both parties. I hope you keep it up. Otherwise I'll be in the dark.